More than 600 different species of fungus are known on the <?xml:namespace prefix = st1 ns = "urn:schemas-microsoft-com:office:smarttags" />Faroe Islands, with just less than half beeing cap fungi, i.e. mushrooms and toadstools with a cap and stem. The cap fungi on the Faroe Islands can be divided into three groups of nearly equal size on the basis of where they grow. Around 100 species of cap fungus, most of which have some sort of association with trees, are found in plantations. They are typically the same species as are found in forests elsewhere in Northern Europe, but they are slightly fewer in number in the Faroe Islands, of course, where the plantations all date from this century. Migration over such large distances takes time, and many plantation fungi also require vegetation of a certain age with a layer of dead leaves and needles on the ground. New species can therefore be expected to turn up in the plantations of the Faroe Islands in the future. Around 100 species of cap fungus are found in the mountains, with many of them living in association with the stunted willows which grow there. Generally speaking, the species are the same in similar locations in the Alps, Norway and Iceland. These fungi have not yet been adequately researched, either in the Faroe Islands or internationally. Finally there are around 100 species of cap fungus on grassland - on the green, grass-covered slopes of the lowlands. The wax caps, or hygrocybes, are the most colourfull of the grassland fungi, and a small selection of them is presented there. Most wax caps are yellow, orange or red, but some are also pale mauve, green, brown, grey or white. The wax caps grow on the ground, where they are presumed to get their nourishment by breaking down dead vegetable matter. These cap fungi have gills on the underside of the cap. The cap generally measures 1-10 cm across, and, as well as differing in colour, the species can also be identified by whether their surface is dry or sticky, and whether it is smooth, scaly or fibrous. The wax caps represent one of the largest cap fungus families on the Faroe Islands. Twenty nine species are known, which is around half the number of species known in Europe. Those which are “missing” from the Faroe Islands are typically species which are linked to woodland environments, or which prefer a lime substrate or warmer surroundings. The wax caps are very particular about where they grow. Most species are found virtually exclusively on relatively dry grassland which has not been cultivated, where chemical fertilisers are not used, and where grazing prevents trees and bushes from spreading. This type of countryside is on the decline in many places in Europe, and the wax caps with it. Consequently many wax caps are to be found on what are known as red lists, i.e. the lists kept by each country of the fungi regarded as being at risk of extinction. The Faroe Islands offer ideal opportunities for the wax caps. The outlying fields are nearly all grazed by sheep, and the steep, grass-covered slopes, do not invite cultivation or other intensive use. The Faroe Islands can therefore be seen as sanctuary for the wax caps, as they are for all fungi, plants and insects which thrive in such locations. 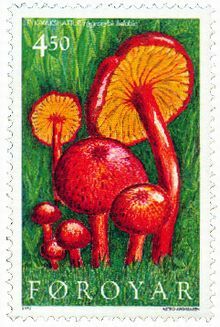 Hygrocybe chlorophana is the commonest wax cap on the Faroe Islands. The cap is 2-7 cm wide and the toadstool is yellow throughout. Both the cap and stem have a dry, smooth surface. Like most other wax caps, it is usually found below 400 metres above sea level. In the mountains it is replaced by Hygrocybe citrinopallida, which is smaller and almost funnel shaped, with gills which go some way down the stem. Hygrocybe psittacina is found there and here in the Faroe Islands. Its cap is 2-4 cm wide, and the toadstool is green in colour, making it unique among wax caps. When the toadstool is mature or has been exposed to sunlight, it fades and turns yellowish, but the top of the stem nearly always remains green. Both the cap and stem have a sticky or slimy surface, making the toadstool difficult to get hold of to pick. Hygrocybe helobia is common on the Faroe Islands. The cap is 1-3 cm wide, and the toadstool is bright red throughout. Both the cap and stem have a dry surface, and the cap has fine scales, particularly around the centre. If the toadstool is sealed in a small box after picking, a garlicky smell can be detected after a few minutes if the box is opened. Hygrocybe virginea is found here and there in the Faroe Islands. The cap is normally 1-4 cm wide, and the toadstool is white or whitish throughout. Both the cap and stem have a smooth surface, and the surface of the cap is slightly greasy. Hygrocybe virginea belongs to a group of wax caps which are almost funnel-shaped in appearance and have gills which go some way down the stem.